Have you ever wanted to go back in time to get a PCAP of something strange that just happened on a PC? I sure have, many times, which is why we are now releasing a new tool called PacketCache. PacketCache maintains a hive of the most important and recent packets, so that they can be retrieved later on, if there is a need. Network forensics and incident response is performed post-event, but requires that packet have already been captured during the event to be analyzed. Starting a network sniffer after a suspected intrusion might provide useful insight on what the intruders are up to, but it is much better to be able to go back in time to observe how they gained access to the network and what they did prior to being detected. Many companies and organizations combat this problem by setting up one or several solutions for centralized network packet capturing. These sniffers are typically installed at choke-points on the network, such as in-line with a firewall. However, this prevents the sniffers from capturing network traffic going between hosts on the same local network. Intruders can therefore often perform lateral movement on a compromised network without risk getting their steps captured by a packet sniffer. 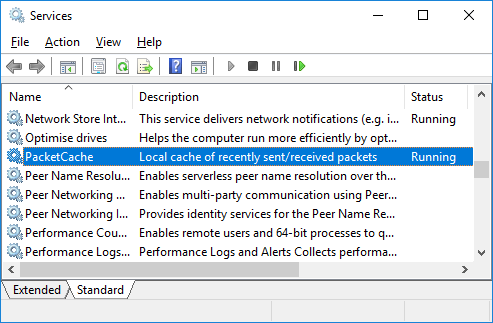 We're now trying to improve the situation for the defenders by releasing PacketCache, which is a free (Creative Commons licensed) Windows service that is designed to continuously monitor the network interfaces of a computer and store the captured packets in memory (RAM). PacketCache monitors all IPv4 interfaces, not just the one connected to the corporate network. This way traffic will be captured even on public WiFi networks and Internet connections provided through USB broadband modems (3G/4G). By default PacketCache reserves 1% of a computer's total physical memory for storing packets. A computer with 4 GB of RAM will thereby allow up to 40 MB of packets to be kept in memory. This might not seem like much, but PacketCache relies on a clever technique that allows it to store only the most important packets. With this technique just 40 MB of storage can be enough to store several days worth of “important” packets. The “clever technique” we refer to is actually a simple way of removing packets from TCP and UDP sessions as they get older. This way recent communication can be retained in full, while older data us truncated at the end (i.e. only the last packets are removed from a session). PCAP or it didn't happen!